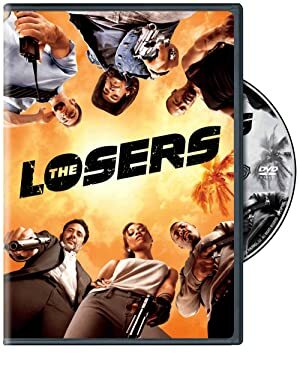 The Losers was a 2003-2006 action techno-thriller series. Though it reuses the name and perhaps some themes from a previous DC Comics feature, there is no apparent continuity between the two. 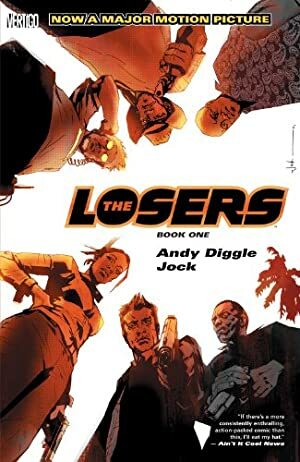 The Losers likely takes place in its own continuity, separate from any DC Earth. The series was notable, starting as a special-military-operations-and-crime, action story but escalating near its end. 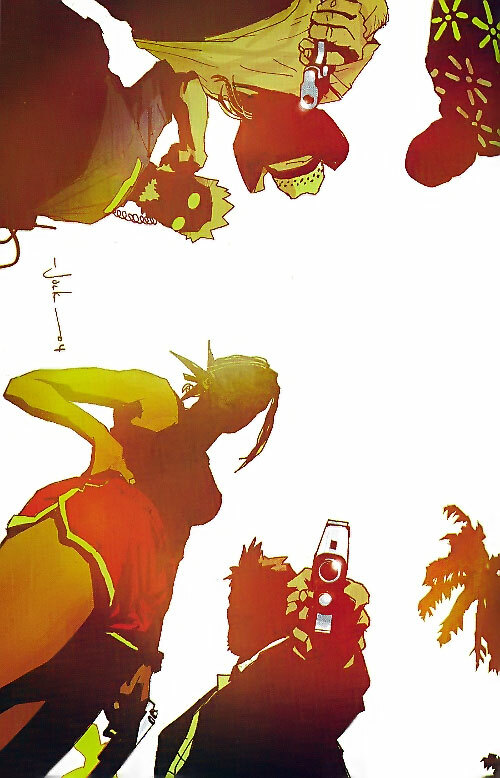 It was also drawn by Jock, whose distinctive style wasn’t well-known in US comics back then. The series was cinematic in nature, yet its adaptation as an action movie in 2010 was something of a surprise. Comic book movie adaptations wren’t quite the juggernaut they’d soon become. Since this article recaps everything, it has S P O I L E R S.
Acceptance of the commanding officer. Roque, the second in command. Pooch, the team’s driver and pilot. On assignment in Columbia they were ordered to stand back as a mercenary unit – led by Wade ’ massacred the village of Santa Maria. These locals were in the way of oil exploration. The Losers obeyed orders, but were disturbed by the experience. Working as military advisors in Pakistan in 1998 they were sent to Afghanistan for operation Draw Venom. The objective was to locate Afghan warlord Ahmed Khalfan Fadhil – an alleged terrorist with connections to Al Qaeda. The commando was to mark the place for an air strike after confirming his presence. Dropped into Afghanistan they trekked to a village where they rendezvoused with Agency operative Max. He directed them to Fadhil’s stronghold in the Khyber Pass. After surveilling the stronghold a few days until Fadhil arrived, they delayed the air strike. The Losers had realised that the target was involved in the child slave trade, and a consignment of “merchandise” had arrived with him. Attempts to contact their CO were met with static and a threat from Max. Following the Columbian incident most of the team felt they couldn’t allow the children to be killed in the strike. They decided to infiltrate the camp under cover of night, get the children out, and make sure Fadhil died. In the complex Cougar saved one of the children from the attention of a guard. He then discovered a badly-mutilated American prisoner who assumed the team was there to kill him. He told Cougar he was Max’s lieutenant – and that Fadhil wasn’t a terrorist but a former business partner of Max’s. Cougar realized the air strike was intended to kill them both and keep Max’s secrets. Despite their stealth the alarm was sounded, and the team had to fight their way out, calling down the air strike behind them. Investigating the ruins they discovered the dying Fadhil, and Clay killed him. Marching the children to their pick-up point, Cougar shared what he’d learned. When they reached the pick-up they were met by only one helicopter where they’d been expecting two. Without room for them and the children they got the chopper to take the kids, planning to walk back to Pakistan. Clay got the pilot to not tell control they didn’t have the team on board. As the chopper took off a US jet appeared and fired at it, sending it crashing to the ground. Cougar was closest when it crashed, but was unable to reach the children. He had to watch helpless as they died. Scarred by the event, he became much more sullen and quiet. Believed dead, the team split up and went into hiding while Clay searched for Max. Five years after Afghanistan, Clay reassembles the team in America. He introduced them to Aisha, who was also hunting Max. Ambushing an Army rescue helicopter, they used it to steal an armoured car carrying a shipment of CIA drugs. The trail led them to the Goliath oil terminal in Houston which they infiltrated – leaving Aisha out to maintain her CIA cover, and Pooch as their exfiltration. They found arms shipments bound for volatile areas, and a quarter of a billion dollars in cash from the CIA’s drug smuggling operations. However, they were betrayed by Roque. He and Wade stole the cash for Max, using the Losers as the scapegoats for the theft. The team was freed from the guards by Aisha, but their escape was limited to getting inside a warehouse with a Moab Fuel-Air Bomb. They kept newly-arrived CIA Deputy Director Sanderson at bay with threats of detonating the bomb, and demanded a helicopter. When the helicopter arrived they moved to the dock – Clay holding a detonator – where they boarded the boat Pooch arrived in. Leading the Goliath guards to a set up location, they made a clean getaway with the hard drive containing the drug operation accounts. Tracking Roque, Wade and the money to the George Bush Intercontinental Airport, they attacked as the pair tried to fly the money away. Clay killed Wade, and Roque appeared to die when the plane carrying the money exploded. Jensen accessed the data on the hard drive. This led them to investigate geological surveys on the Caribbean island of Montserrat. They found Max’s mercenaries already on the island digging out something in a villa. Their prize was buried under soot and ash from the local volcano. Engaging the mercenaries as the volcano erupted, they grabbed the safe Max wanted. The Losers absconded in the mercenaries’ plane. The trail led to an oil rig off the coast of Qatar. On their arrival in Qatar they were taken into custody by Sheik Abdul Aziz Ibn Al Walid – political advisor to the royal household. He was aware the Losers were after Max and offered help in return for their services. He revealed Max was behind the P2OG operation being carried out by the local CIA office. P2OG performed operations designed to provoke terrorist retaliations, allegedly so that the fanatics were drawn into the open. The Sheik revealed Max had informed a local terrorist cell of the CIA office’s location, and they would soon attack it. The Sheik couldn’t move against the terrorists himself for fear of endangering his position. But neither could he let Americans die and draw retaliation against his country as Max intended. The Losers agreed to help, and got the Americans out alive. These included Stegler, a veteran CIA agent. 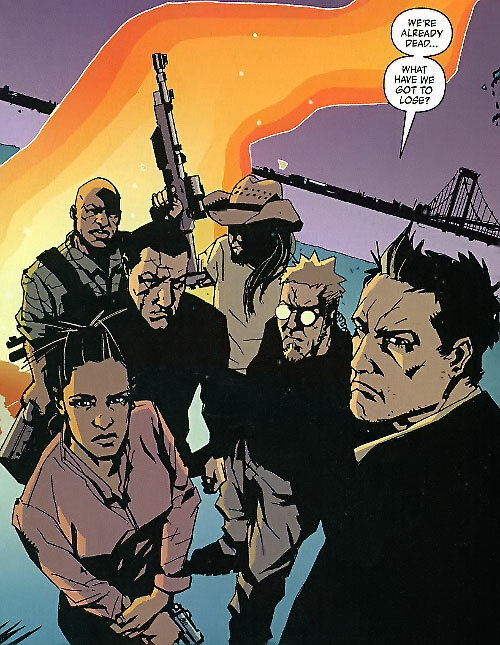 Stegler had been tasked by Sanderson with using the Losers to find Max ’ whom he believed they worked for. The Sheik let them investigate the abandoned oil rig under cover of being a Hollywood scouting party. A few days scouring the rig turned up nothing so they moved to the next lead. On the way, Aisha revealed to Clay why she was hunting Max – Fadhil was her father. Arriving in London they investigated Max’s links to the Cayman Credit Internationale (CCI) bank. Infiltrating the bank, Clay and Aisha were confronted by Stegler. Revealing Sanderson had been killed, and that CCI was an Agency operation, he offered to work with them. Stegler had deduced they were opposing Max. They set up a sting on the courier due to arrive from Max, using his password entry to gain access to Max’s accounts. The courier turned out to be Roque. After a fight with Clay, Roque escaped with the case he’d come for, unaware it contained a sophisticated tracker. Accessing Max’s accounts they learned he was an investor in PAM – the Policy Analysis Market. PAM forecast terrorist activities based on financial market conditions and allowed it’s investors to make money betting on the probability of these events. They realised Max had been using the P2OG operation to provoke acts of terrorism from which he could profit. The team tracked Roque to the Azores where he led a mercenary group onto a rusty tanker. The team slipped onboard as it set sail, and saw him set an ambush for a rescue helicopter. He intended to use it to board one of a pair of poorly defended ships carrying decommissioned weapons grade plutonium. The Losers interfered with the ambush. All except Jensen escaped in the helicopter to warn the nuclear convoy. Jensen – separated from the others – barely evaded Roque. He threw a dead mercenary into the water to pretend he was making a swim for it. Roque shot the corpse. As Roque’s tanker approached the alert convoy ships, a Russian submarine whose crew Max had bought carried out the contingency plan. They torpedoed the ships, forcing their crew to abandon them. On board Roque’s ship Jensen found the deactivated explosives Roque had intended to sink it with. Reactivating them, he snuck off with a life boat before the ship blew. Roque was rescued by the Russians – who recovered the nuclear material from the sunken ships – while Jensen collected the other Losers. Tracking Roque and the nuclear material to Pripyat – a deserted city near Chernobyl. 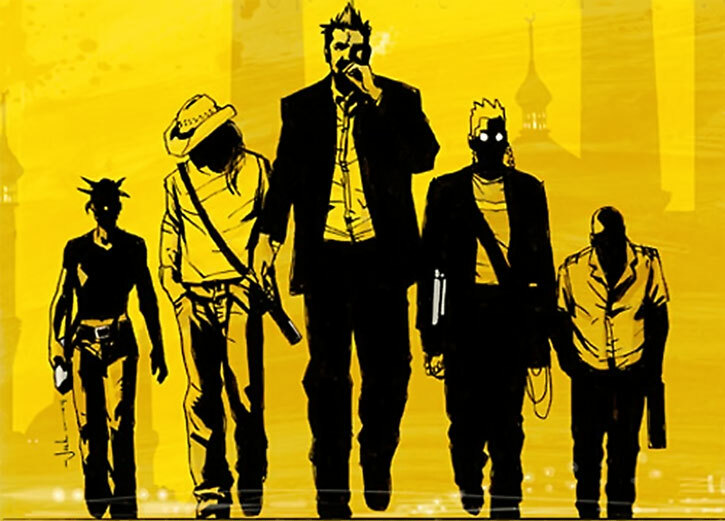 The Losers searched the town. Cougar and Pooch were ambushed by Roque’s men, and Pooch was taken prisoner before the others could respond. Jensen managed to detect the signal from a bomb disposal robot used to assemble the nuclear bombs. He activated its camera so they could see Pooch. Rushing to find him, they were still nowhere near when Roque decided he’d tortured Pooch enough – having removed a finger with bolt cutters. He prepared to kill him. Jensen activated the robot’s shotgun – used for detonating explosives ’ and shot Roque, sending him hurtling to his death. Pooch uses Roque’s gun to hold off the mercenaries and to disarm the bomb they left behind. The Losers located Pooch. They got him and the just completed nuke out of there. Their helicopter was just far enough from the city to avoid the explosion of another nuke left behind, but the EMP sent their helicopter crashing to the ground. They survived, and Stegler took the nuke to a secure location. Pooch – tired of their mission – quit and returned to his family. While this had been transpiring, Max and his men had set up on the oil platform off the Qatari coast. Taking advantage of the geological research found by the team earlier, they raised an island under him which he named New Jerusalem. He immediately made an international broadcast that this was the heart of his new American empire. Max also announced he had nuclear weapons hidden in cities around the world, to be used if anyone moved against him. The Pripyat explosion was a demonstration of this threat. The remaining Losers returned to Qatar. There, the Sheik provided them access to a secret pipeline to the oil platform. They made their way undetected inside New Jerusalem’s defences, and found Max. They were followed by Fahd – Aisha’s jihad partner – carrying the bomb he’d stolen from Stegler. When Clay’s shot at Max failed he was caught by an incendiary grenade thrown by Aisha. She no longer needed the Losers. Covered in flames, Clay still managed to charge Max and send them both plummeting over the edge of the platform. The remaining Losers learned Max was actually a pair of identical twins. The second of those shot at Aisha. She escaped out a window, surviving the fall. Cougar and Jensen missed their shot at the other Max, and retreated to the secret pipeline. They were surprised at the pipe entrance by Fahd, who seriously wounded Cougar before they killed him. They deactivate the bomb. But when Cougar realised he wouldn’t make it through the pipe he decided to stay with the nuke, buying Jensen time to escape before detonating it. Reluctantly leaving him, Jensen made his way through the pipe. He emerged into an empty ocean. The ship the Sheik promised to collect them was nowhere to be seen. Back on the island Aisha charged a hundred mercenaries to reach the dock before the bomb exploded. Pooch arrived in time to collect Jensen, getting them out of range as Cougar triggers the bomb and destroys New Jerusalem. Pooch and Jensen faked their deaths in the crashed plane, returning to being presumed dead. Stegler approached them a year later to return to the Agency, but they pointedly declined. Max was originally triplets, all of whom had low-level mental abilities. Shortly after their recruitment by the CIA, one fell out with his brothers and left. Adopting the name Max Lord he became a businessman. When he became successful enough that his influence could be of use his brothers attempted to get him to rejoin them. He refused. They organised his death, and took turns taking his place. They then combined their influence in intelligence circles, and Lord’s resources, to take control of Checkmate. When this plan was uncovered, one of the brothers was killed by Wonder Woman, while the other continued their plan to raise New Jerusalem. 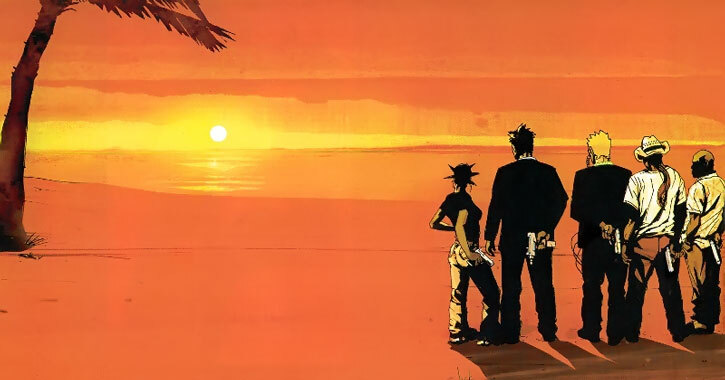 When the Losers finally faced the surviving brother, he used his mental powers to make them think Clay had taken him plummeting to their deaths. Silenced Micro-Uzi [BODY 04, Projectile weapons: 05, Ammo: 05, Thief (stealth): 03, R#03, Advantage: Autofire, Limitation: Thief only to muffle the shots]. For less cramped commando work they use H&K MP5SD3 [BODY 04, Projectile weapons: 05, Ammo: 06, Thief (stealth): 03, R#02, Advantage: Autofire, Limitation: Thief only to muffle the shots]. The handgun is probably a Kimber .45 1911 MCSOCOM [BODY 04, Projectile weapons: 04, Ammo: 07] and it can easily be fitted with a Tactical Underbarrel Light [BODY 03, Flash (steady illumination): 03] when needed. When on an operation, they also have a TACTICAL RADIOS [BODY 03, Radio communications (encrypted): 05]. They would also have whatever equipment was appropriate to the mission at hand (e.g. climbing gear, parachutes.). 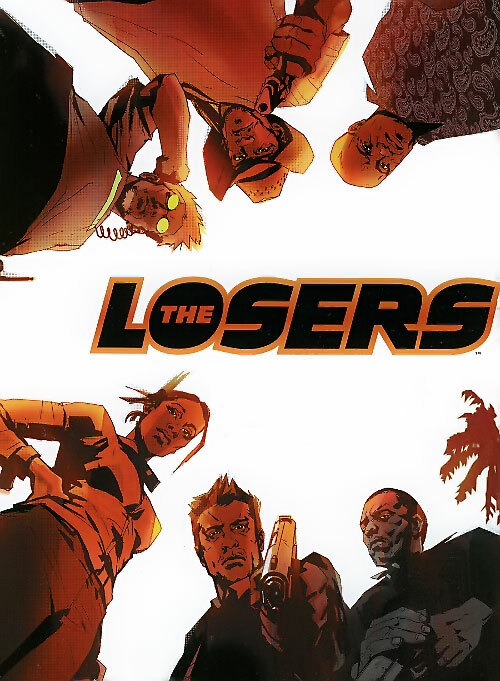 Source of Character: DC Comics (The Losers, Vertigo series, #1-32 (2003-2006)). Writeup completed on the 10th of December, 2012.